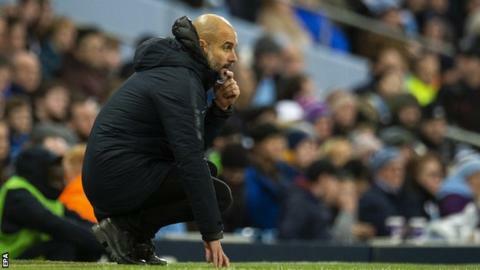 Manchester City manager Pep Guardiola has told his players to forget about leaders Liverpool in their pursuit of a second straight Premier League title. City beat 10-man Wolves 3-0 on Monday to reduce the gap between themselves and the Reds to four points. "We can't do anything about Liverpool's games, they belong to them," said Guardiola. "The only way to put that pressure on is by being there and maybe one day they fail." A Gabriel Jesus double and Conor Coady's own goal earned City a comfortable victory over Wolves - who had defender Willy Boly sent off after only 19 minutes - at Etihad Stadium. Jurgen Klopp's Liverpool side had briefly moved seven points clear with a 1-0 win at Brighton on Saturday and Guardiola wants his team to "be there until the end". "I say to them don't look at the calendar for Liverpool's games, forget about it - because normally when that happens you lose your games," said the Spaniard, whose side had a run of three defeats in four league games in December, enabling the Reds to open up a lead at the top of the table. "It is not easy to maintain this consistency because it was incredible the numbers we had last season. Liverpool are one team and they have done better so far. "We have spoken many times in the last hours with our players. We cannot control what they do; we can control what we do. "If we don't win, they will be champions - so that is why we have to put pressure on by winning our games." How tight is this season's title race? Normally Liverpool's impressive start would mean a sizeable lead. However, a four-point cushion is the smallest of any team with at least 55 points after 22 matches of a Premier League season. Never before have two teams had more than 51 points at this stage in the competition but this term Liverpool have 57 and City have 53. Do neutral fans not want Liverpool to win the league, or is it just a social media myth?